Are you looking to gift your family and friends an adventurous extravaganza? Or maybe looking to explore your wild side with your loved ones? Then we have just the card for you. With the Arabian Adventure Gift Card you can treat your family and friends to an exciting range of tours, safaris and activities. Whether you are looking to cruise along the Dubai Creek or dine among the dunes – the choice is yours. Take a city tour, explore the Wadi, go desert driving, sandboarding or camel riding. With this Gift Card, we guarantee that there’s always something for everyone. 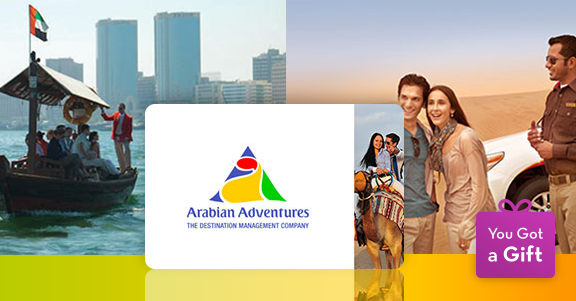 Being a part of the Emirates Group, Arabian Adventures is one of the most dependable tour operators in town with multiple departure points around the UAE and multi-language tours. From sightseeing city tours to desert safaris, Arabian Adventures offers guests a wide selection from which they can choose from. Have you ever been to an overnight safari trip? Or sand skiing? The experience will truly be unforgettable for your loved ones as they embark on a tour which includes dune bashing, camel ride, live entertainment with dinner in the dunes, interacting with the falcons and a chance to spot the wildlife with the morning dune drive. Looking forward to this and more? 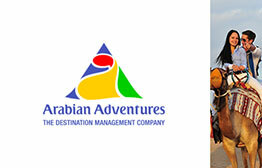 Arabian Adventures makes it possible! Your family and friends can discover Dubai’s best attractions by taking in the sights and sounds of the futuristic wonders of Dubai or simply explores the cultural sites in Sharjah and the capital city, Abu Dhabi. What’s even better is they tailor-make a package just for their guests and use a portion of the fees charged towards supporting local conservation in the Dubai Desert Conservation Reserve. This Gift Card is truly something special as it provides lifelong memories for your family and friends which they will surely cherish on their first trip to the UAE and experience all that this beautiful city has to offer. With the Arabian Adventures Gift Card, your loved ones will be guaranteed an experience to remember full of wonder and thrills!